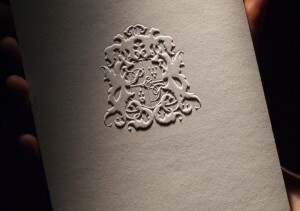 Blind debossing or embossing is the unsung hero of subtle, elegant design. It is a stripped away look, where the design pressed in (or popped out) of the paper without using foil or ink to highlight it. The effect is most obvious with plain, beautiful quality paper. The interplay of highlights and cast shadows creates a sculptural effect and really lets the stock sing without distraction. We have been playing with the sculptural possibilities of blind embossing and our technology (CLIQX) here at the Watermarx Graphics “lab” with some amazing results. Our favourite designs tend to use a thick, white cotton card stock, for the airy minimalism and beauty of simplicity. You can even emboss metallic stocks! The piece in this picture (below) is actually an embossed sheet of aluminium. Be daring! Don’t feel shy about running your wild ideas by us. 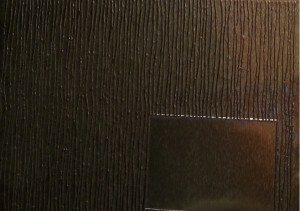 Ask us what you have in mind and we can advise if it’s possible emboss on a particular stock or substrate. This entry was posted on Wednesday, April 8th, 2015 at 4:14 pm	and is filed under Debossing, Embossing. You can follow any responses to this entry through the RSS 2.0 feed. Both comments and pings are currently closed.